The incessant demands for integrating next-gen technology, coupled with the need to shore up legacy systems with the evolving business structure, are driving the expansion of global application management solution (AMS) market. Today, a major fraction of these application services are focused toward enterprise resource planning and HR management services. As growing number of small and medium businesses add these complex applications to their portfolio, their monitoring and management services demands are expected to rise. Senior market research analysts anticipate that the global AMS market shall grow at a compounded annual growth rate of 4.75 percent during the period between 2017 and 2021. Seeking to modernize, businesses are slowly replacing traditional on-premise application management solutions with multi-tenant hosted services. Additionally, there is an increasing trend for businesses to subscribe to application management software that is available over the internet (as per needs) rather than adopting full-time SaaS based models; connecting the latter with improved cost efficiency. Owing to emergence of software delivery processes such as DevOps, the demand for application lifecycle management has also perpetually increased. As the industry matures, vendors are anticipated to leverage industry collaborations, platform integration, and strategic alliances to capitalize on the AMS market growth. Currently banking, financial services, and insurance segment are the largest adopters of application management solutions in the market owing to the criticality of operations and sheer complexity of functions and applications. However, in the coming years, the healthcare industry also showcases a promising proclivity toward application monitoring and management. In the last few months, a distinguished panel comprising CEOs, CIOs, VCs, and analysts including CIOReview editorial board reviewed the top companies that provide pioneering services for application management and have shortlisted the ones that are at the forefront of delivering modernization. 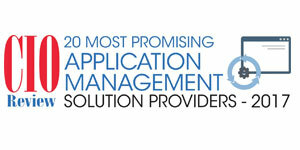 We present to you “20 Most Promising Application Management Solution Providers-2017”.